Form No.4.-100 - 17.8.10 Delivery Date 14 APR 1912. No. "OLYMPIC", Handed in at TITANIC. To : OLYMPIC. Eleven pm NEW YORK TIME TITANIC SENDING OUT SIGNALS OF DISTRESS ANSWERED HIS CALLS. 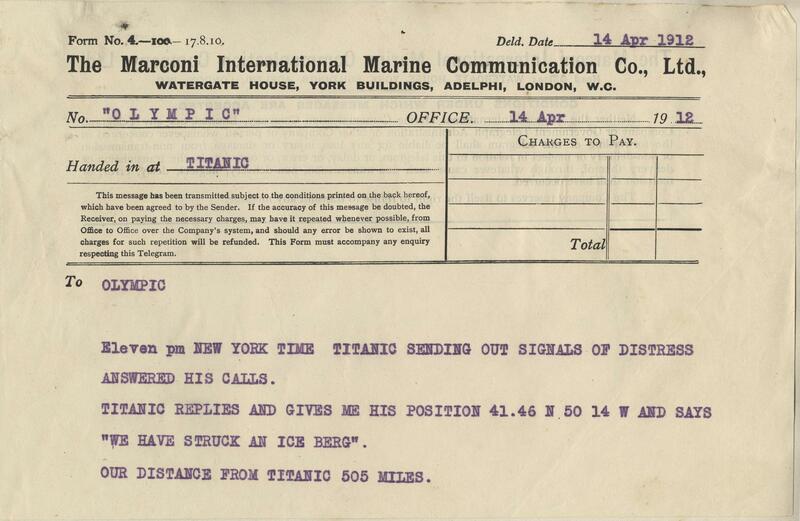 TITANIC REPLIES AND GIVES ME HIS POSITION 41.46 N 50 14 W AND SAYS "WE HAVE STRUCK AN ICEBERG". OUR DISTANCE FROM TITANIC 505 MILES.